My husband and I have an agreement that I squint when I look at his desk area. He keeps it orderly most of the time, but not all the time. It isn’t all his fault, though, because the kids pile their stuff on his desk all the time. After a bit of time paying attention to what gets left there, I noticed that the kids were piling their piano books on his desk. I did have a basket for their piano books, but the basket just wasn’t doing the trick. Time for a change. 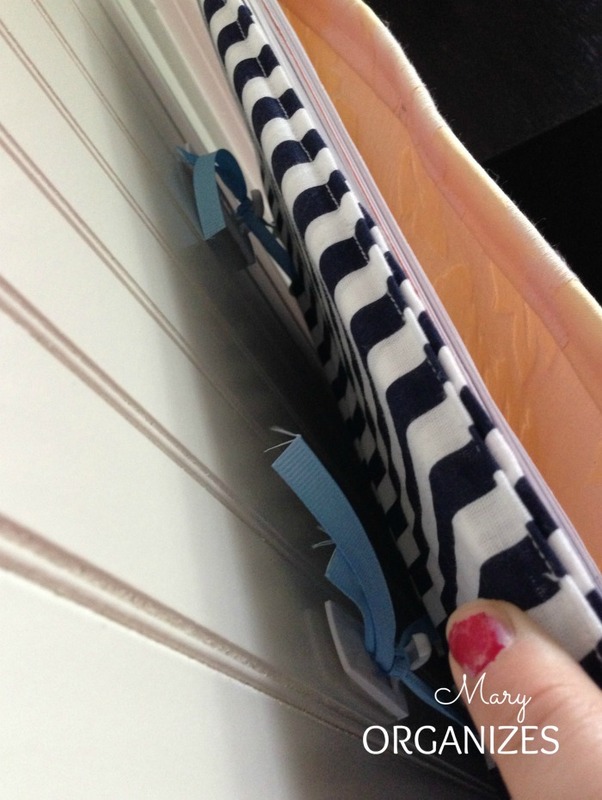 I’ve been in a sewing mood lately and had the idea to try to sew something to hold the books. 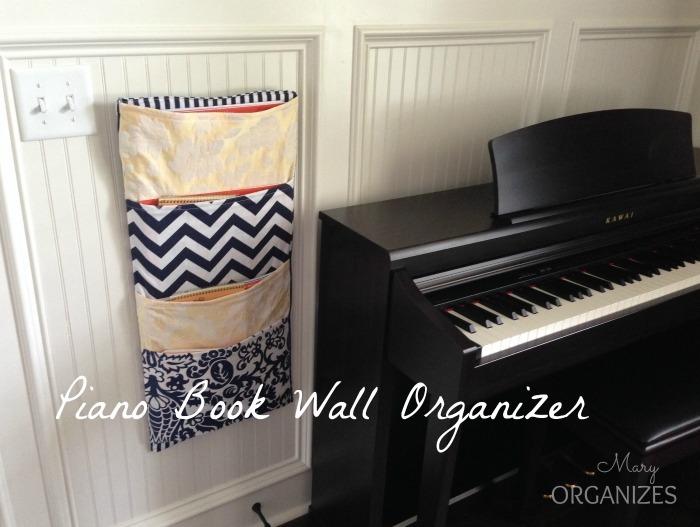 I wanted to use the wall space next to the piano. This is what I came up with. I made four pockets. 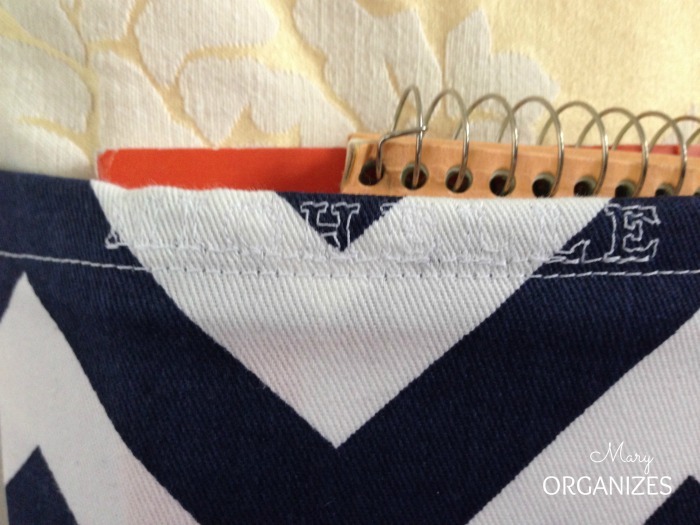 Even though my toddler isn’t having lessons yet, I still made an extra pocket for him. To create it, I cut a piece of foam board the size I wanted on the wall. Then I sewed the pockets onto fabric and made a “slip cover” over the foam board. That is what gives it a firm rectangular shape. There are a few ribbon hooks on the back of the holder that hang on wall-hooks. It makes me happy and now there will at least be fewer piano books on my husband’s desk … hopefully. Cute idea! I like it! What a super idea! I’m a piano teacher, and I can’t tell you how many times I hear that a student has misplaced a piano book (or 2 or 3) in the chaos around their piano. With your permission, I’d love to link to this post at my blog! I’m loving this! 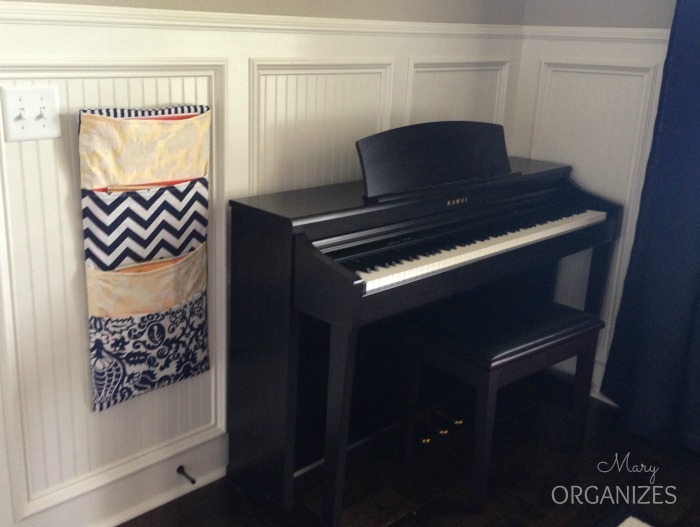 Our piano is in our dining room, a semi-formal area, but I can SO see this project in a bit of fabric left over from the draperies, right? 🙂 Also I am thinking a couple of hooks could make it hangable from the top of the side of the piano under the lid (upright grand) y’think? I think that would definitely work! I’d love to see your finished product! Well, I think the next few weeks will not be a good sewing time! 😀 But after that, I shall give it a try! Also, do you use mainly Alfred piano teaching books/methods for all ages? When I taught before I was a nervous wreck trying to pick out books for the kids at the right level – there were SO many! Alfred is my favorite – but every piano teacher has their own favorite and they really are all pretty good, at least all the ones that have been around a while and are time-tested.